Ooooh- this is a thinking person’s mystery as every sentence of Mason’s prose feels so carefully crafted that you want to savor those precise combinations of words. Story-wise, it’s full of black humor (think Gone Girl). Basically, a guy sorta-accidentally kills his nemesis and buries him in the backyard. He’s so plagued by guilt that he can’t even mow his lawn. He hires a landscaping crew, which uncovers a dead body…but NOT the one our hero has buried…not to be missed! For fans of the Coen brothers' films or for those who just love their thrillers with a dash of sharp humor--an engaging and offbeat story about a man driven to murder, who then buries the body in his backyard only to discover that there are two other shallow graves on his property. ""There""is very little peace for a man with a body buried in his backyard."" With this memorable first line, we meet Jason Getty, a regular guy in every mild sense of the word. But extraordinary circumstances push this ordinary man to do something he can't undo...and now he must live with the undeniable reality of his actions. And just as Jason "does" finally learn to live with it, a landscaper discovers a body on his property--only it's not the body Jason buried. As Jason's fragile peace begins to unravel, his life is hitched to the fortunes of several strangers: Leah, an abandoned woman looking for answers to her heartbreak; Tim, a small-town detective just doing his job; and Boyd, a fringe-dweller whose past is about to catch up to him--all of them in the wake and shadow of a dead man who had it coming. 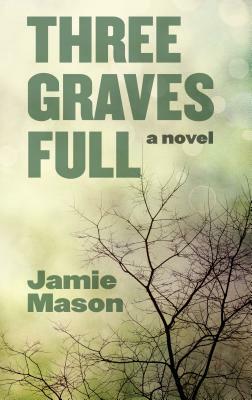 With the tense pacing of a thriller and the language and beauty of a fine literary novel, "Three Graves Full" heralds the arrival of a stunning new voice in fiction.